I am often asked what is my favorite Asian food and wine pairing and without hesitation I say: “Peking duck with Pinot Noir.” The crispy duck skin, however you enjoy it, requires a wine with good acidity and none fits the bill better than Pinot Noir. Whether you prefer the skin Beijing-style, dipped in sugar, or rolled in thin flour crèpes with spring onion, cucumber and plum sauce, a young, fruity Felton Road Block 5 Pinot Noir from New Zealand cuts through the fat and even stands up to the sweet, salty sauce. If the duck meat is served, it brings out the savory, spicy elements of Felton Road Pinot. 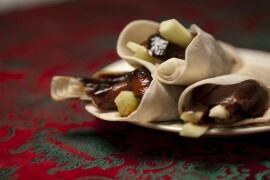 Great Peking duck is layered and nuanced, just like this wine made from biodynamically farmed grapes.